I will post purchase cost and availability details as soon as I have them, but I am told you can choose PDF, Kindle or hardcopy when it goes on sale. The cinematic equivalent of someone puking on a bad Christmas sweater–IN COLOR! If you love bad movies, this one just has to cap it all: Santa Claus vs. the Devil (1959). Not only is it a fairly strange mashup of the (largely) secular and religious aspects of Christmas (for comparison, think of the Easter Bunny hanging from a crucifix–eww), but it also incorporates space travel a full five years before Santa conquered the martians in … Santa Claus Conquers the Martians. If you can sit through all 95 minutes, I’d consider that a Christmas miracle. If you’d like something a little less erp-inducing, try Christmas Angels, featuring “Hoofbeats on the Rooftop” by yours truly. WHAT FEARS BECOME – Collected Suspense, Horror, and Dark Fantasy is featured in today’s FREE KINDLE NATION SHORTS; plus a link to enter to win a Kindle Fire! A delicious sample of horror and suspense is offered up in today’s 10,500-word Free Kindle Nation Short, scary dishes chosen just for you from the 31 stories and 18 poems in the book. Click here to begin reading the free excerpt. I don’t know why, but December is a banner month for traffic at exlibrislarsen.com. It’s already the busiest month I’ve had since I planted my flag in early June, beating the bump I got in August from WHAT FEARS BECOME visitors, and it’s only December 16th. 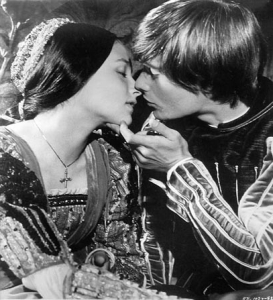 And hopefully, that’s the last time I ever mention Romeo & Juliet on this website. Welcome high schoolers! “Bast” now available in IMAJIN THIS! 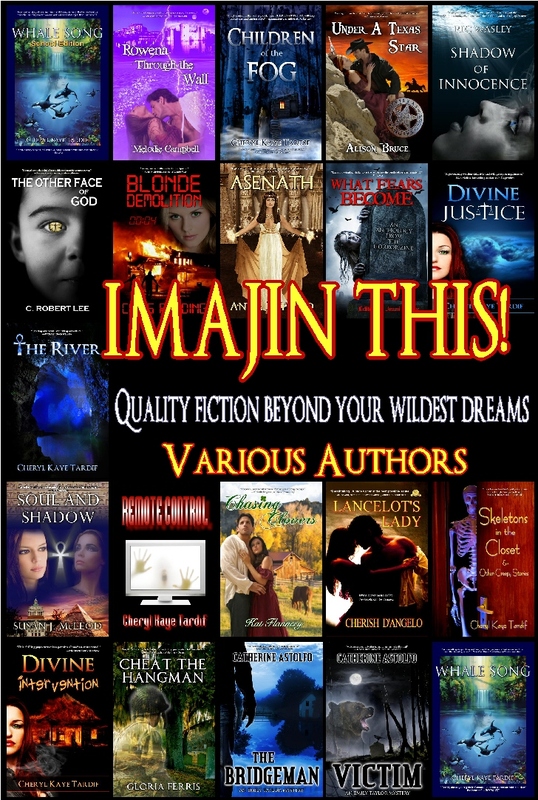 My short story, “Bast,” is now available in Imajin Books’s new chapter ebook sampler, Imajin This. The exclusive ebook allows to you read the first three chapters of each book published by Imajin since the beginning of 2010. Inside you’ll find a wide range of genres, including: mystery, suspense, romance, horror, fantasy, paranormal, young adult, and more. Imajin This! is available for download through Smashwords and Amazon, where you’ll also find What Fears Become: An Anthology from the Horror Zine, “Bast’s” original publication home. Editor of The Horror Zine, Jeani Rector, has put together a collection of stories, poetry and art that will inspire and delight. Every page contains horrors ranging from a man-eating carpet to the souls of fish and sharks, and, of course, some of the usual suspects. Each story is a chiller, guaranteed to disturb even the most hardened horror reader, keeping them sweating and horribly awake through the witching hour and beyond. 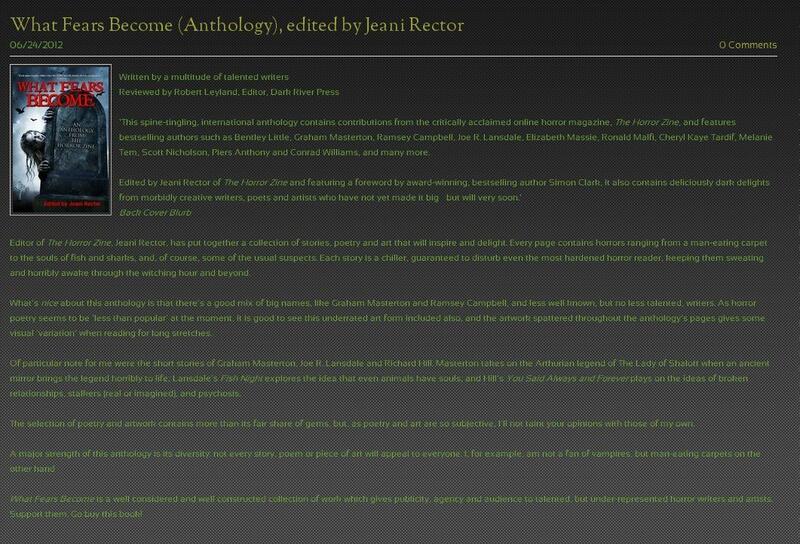 What’s nice about this anthology is that there’s a good mix of big names, like Graham Masterton and Ramsey Campbell, and less well known, but no less talented, writers. As horror poetry seems to be ‘less than popular’ at the moment, it is good to see this underrated art form included also, and the artwork spattered throughout the anthology’s pages gives some visual ‘variation’ when reading for long stretches. Of particular note for me were the short stories of Graham Masterton, Joe R. Lansdale and Richard Hill. Masterton takes on the Arthurian legend of The Lady of Shalott when an ancient mirror brings the legend horribly to life; Lansdale’s Fish Night explores the idea that even animals have souls; and Hill’s You Said Always and Forever plays on the ideas of broken relationships, stalkers (real or imagined), and psychosis. The selection of poetry and artwork contains more than its fair share of gems, but, as poetry and art are so subjective, I’ll not taint your opinions with those of my own. What Fears Become is a well considered and well constructed collection of work which gives publicity, agency and audience to talented, but under-represented horror writers and artists. Support them. Go buy this book! Click here for a screencap of the review. You are currently browsing the exlibrislarsen blog archives for December, 2011.